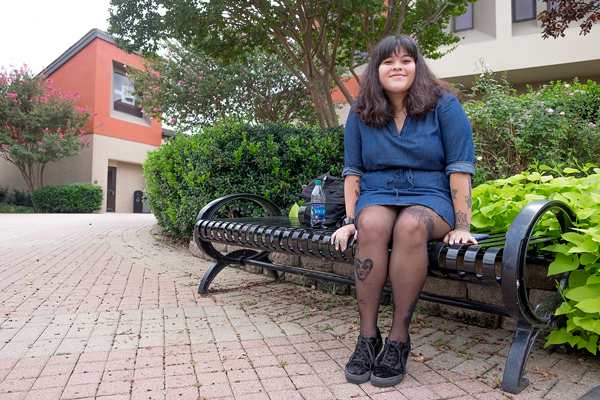 Psychology major Geneva Moiser, 21, discussed goals, school and tattoos with Deziree Ortega. Q. What do you do outside of school? Q. Why did you choose psychology as your major? A. All sorts of things really. I have my own issues with mental illness. It’s something I want to figure out for myself and others. It’s something that runs in my family, so it’s an interesting topic for me to see how it affects other people, as well as to help other people. Q. Did you ever go to therapy or counseling? A. I did for a long time when I was younger. I stopped when I was like 13 or 14. It definitely helped a lot. Q. Do you have a professor at Eastfield that’s impacted you? A. Yeah, my first psychology teacher, Professor Thomas, was pretty cool and taught us a lot. I want to become a clinical psychologist. He taught us a lot about the ropes of getting (into that profession). Also, my second psychology teacher, Professor Varghese, works at Parkland and Dallas County Jail and tells some cool stories. Q. I noticed your tattoos. Do you have any you’d be willing to talk about? A. I’m not sure if you’ve seen this one – it’s a lamp on my thigh. It’s a Tiffany’s lamp my grandma gave me before she passed away, when I was young. So I got that tattooed on me and underneath it is her birthdate. That’s my favorite one. Q. How old were you when you got your first tattoo? A. I was 16, and I definitely don’t recommend that. Q. Did your parents know about it, or did you hide it? A. I hid it for a little while and then I ended up telling my mom. It’s a peace sign right here in the middle of my foot. There’s no way in hiding that. Q. Couldn’t you wear socks? A. When you first get a tattoo you have it wrapped for a couple hours. Since it’s an open wound, you have to let it breathe, so I couldn’t wear anything that would rub up against it. So I told my mom “Hey mom, I got this,” and she was so mad at me. Q. Do you have any others you’d like to talk about? A. Probably this one. 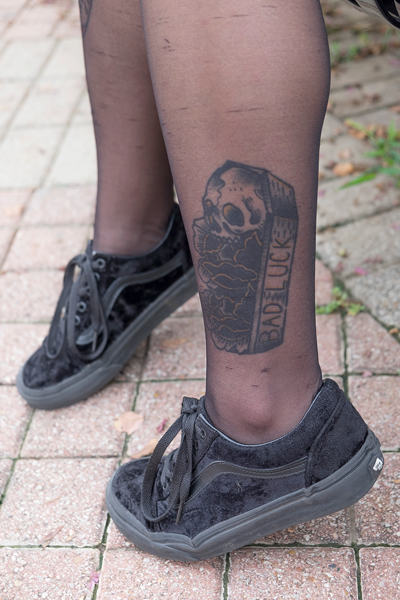 It says bad luck, which is all I’ve really had. Also my favorite number is 13. I embrace it in a way. A. Honestly everything. My family and even my dog. Everything around me motivates me in a way. My classes motivate me to obviously do better. My family motivates me because I want to do right by them. My mom sacrifices a lot for me to go to school. Q. Where do you see yourself in five years? Do you plan to stay in the Dallas area after you finish at Eastfield? A. The cheapest option would be to stay in Texas for university, but I was thinking of applying to an American university in Paris. That’s something I really want to do. In five years I’d like to see myself somewhere in Europe or maybe Tokyo.